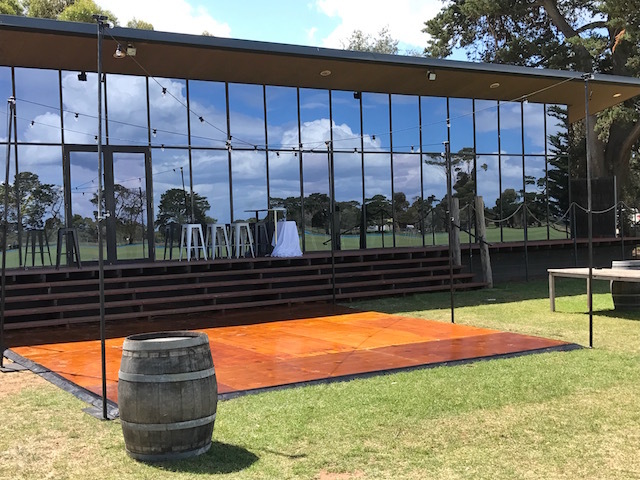 The thought of an open air dance floor may be a long way from our minds in the middle of June but summer is just around the corner. This set up at Werribee Mansion from March this year worked a treat on a cracking warm night. Its fair to day nothing comes close to a rocking outdoor dance floor on a balmy night. 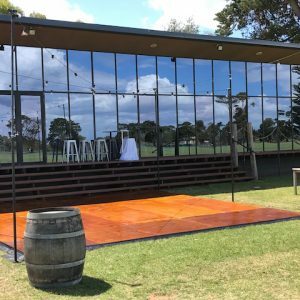 We simply love the look of this timber outdoor dance floor installed with a festoon light canopy, all rounded off with wine barrels. A great rustic wedding look. Using our custom made telescopic festoon rigging poles, we are able to create any light configuration for your event. Using a dimmer controller with our incandescent warm white globes allows the mood to be set just perfectly. Contact us for all your dancfloor and festoon light requirements.